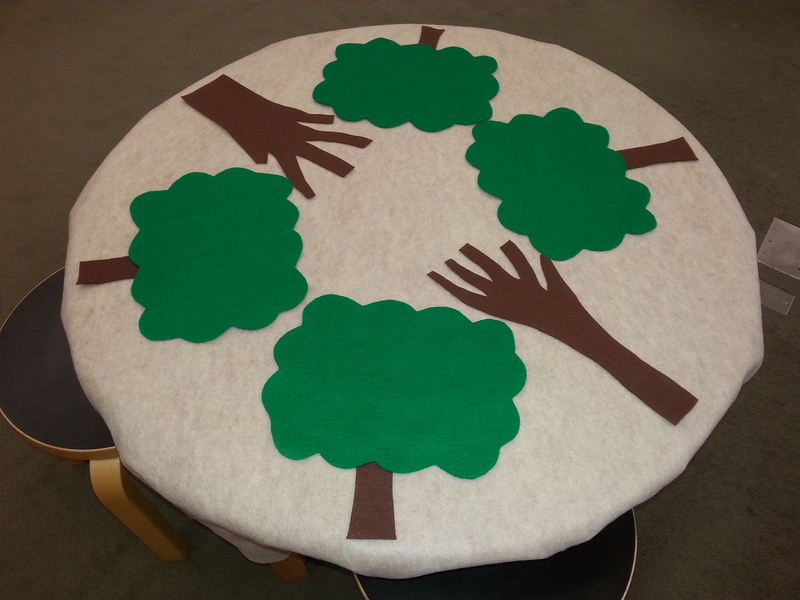 I tested out my felt board table during this year’s summer reading program. It was a huge hit! Children of all ages, and most of their grownups, loved playing with the variety of pieces. So, I decided to create a fall table. 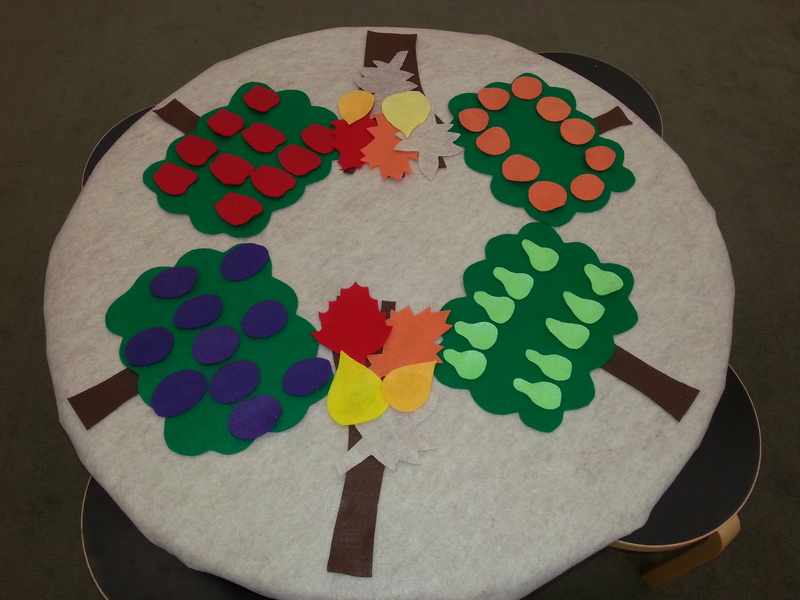 I created four leafy trees and two bare tree trunks. I made sets of 10 fruits that grow on trees: red apples, oranges, green pears, and purple plums. 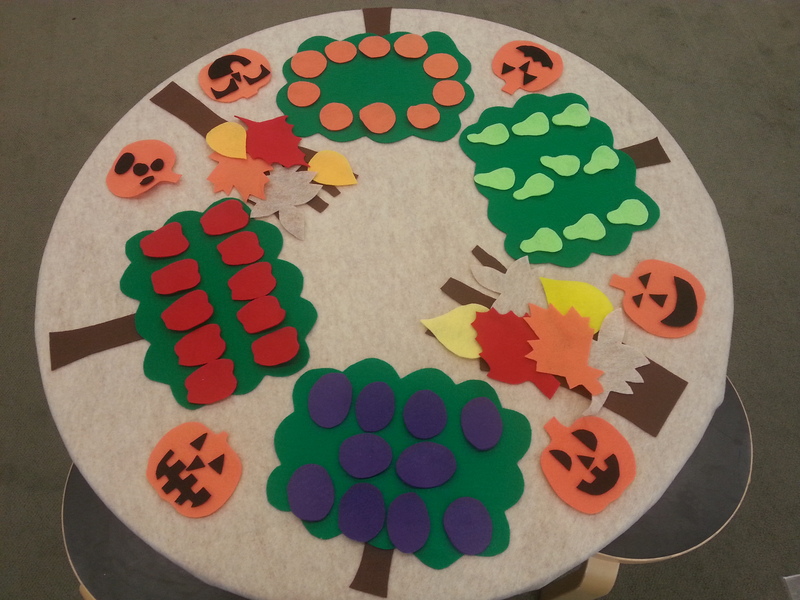 I also cut out yellow birch, red maple, orange oak, and brown hickory leaves to add to the bare tree trunks. Children can practice counting and color identification. I’ll also leave out some people and modes of transportation to allow creative play and storytelling. This time, after getting a little help from my Flannel Friday Friends, I pre-washed the felt to preshrink it and then sprayed it with Scotch Guard. I’ll report back to let you know how it holds up. Hopefully I’ll be able to use it again this time next year. For more flannel ideas, check out my friend Ms. Kelly at the Library. She’s hosting this week’s blog hop. To find out more about Flannel Friday, check out the website, the Pinterest board, and the Facebook Group. Great idea! How did you attach the felt to the table? A few Velcro tabs and the felt stays in place. I added rubber bands around the legs to hold the felt, too, but it’s not really necessary. Our Friends of the Hantsport Public Library are sponsoring our 4th annual ghost writing contest for children and adults. On the 17th of October the winners will get to read their winning stories at our local community centre building, an historic 1860s home, Churchill House. The winning entries receive a $30.00 cash price & a treat! Last year, we did an interactive reading of the book, The Witch’s Hat by Tony Johnston. Thanks Angela Reynolds for the suggestion and the books! It was a lot of fun! This year I am looking for some other suggestions. We would like to do a reading of an interactive book again as well as any other ideas you might have. We only have about a 1/2 hour and don’t want it to be too time consuming or complicated. Also, the children’s ages range from preschoolers to high school. Hey Lois! A few titles come to mind: I Need My Monster by Noll, Room on the Broom or Gruffalo by Donaldson, Miss Smith’s Haunted Library by Garland. I’ve never used props with any but I’m sure you could! 🙂 Hope this helps. I’ve used them all with all ages and they are crowd pleasers. I always like the Little Red House with no windows or doors because of the surprise ending. Are you familiar with the story? You could probably Google it. 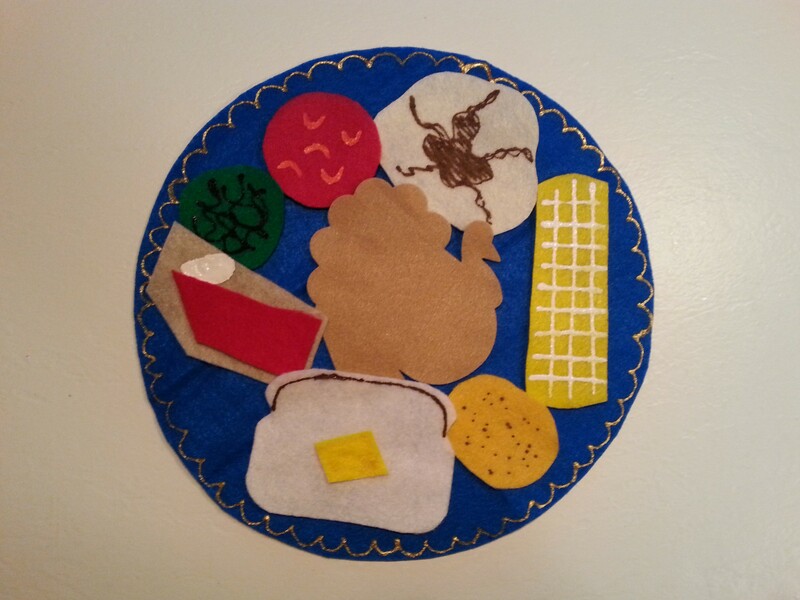 This entry was posted on September 10, 2014 by mrsshaia in Felt Table, Flannel Stories, Passive Programming and tagged Felt table, Flannel Stories, Passive programming.